1. Eat Blue Bell Ice Cream – anyone who has ever had this knows why this is high on the list of best things to do in Texas. 3. Schlitterbaun – the worlds best water park and one of my top 10 days of my life was spent there. 4. The park with the dinosaurs footprints & fossil hunting out in central Texas. 5. Gulf Style Seafood Boil – so gross but so yummy. 8. BBQ – so many great options, I can not limit it to one specific place. 9. Tall Dudes – the guys in Texas are so much taller than on CA. 10. Hang Out With Family – I have a great family and going to Texas allows me to see so many of them. 11. Summer Nights – days that are hot as hell give you beautiful summer nights. Cross another thing off the To Do List; the holes are dug and the poles are in the ground!!! This weekend Joe & I spent Saturday digging the remainder of the post holes that we were unable to get to last weekend. This time we rented the two person auger. It was so much better than the single person auger. The machine is way more powerful and the bit on this one was different than last weeks, so it actually cut into the ground. After using the one today, I am convinced that the bit we got last week was faulty. Either way, if I ever have to dig more post holes I am only renting the two person auger not the single person auger. Joe and I had trouble getting the auger initially. My car is in the shop so I have been driving Katy’s. We took her car to the local rental place but they didn’t have a two person auger. They called around and the Campbell location had one so we drove down there. We got the auger and signed the paper work and the guy told us how to use the machine, but when we tried to load it into the car, it didn’t fit. Frustrated, we checked the internet and it said that the car shop opened at noon. Believing I could get my car at noon, we drove from Campbell to Palo Alto (takes about 40 minutes). We got to PA right before noon and no one was there. We waited and waited but no one ever showed up. After an annoyingly long time I needed to pee, so we to my parents house a few blocks away. There I commandeered my dad’s SUV. We then drove back to Campbell, finally got the auger and made it home. In all, it took 3.5 hours to get and damn machine. I was starting to worry because last week the post hole drilling took so long, but this machine was so much better that we got just as many holes done in half the time! Woo Hoo!! A special thanks needs to go out to my dad. He showed up and was a huge help. My dad and I took turns running the auger with Joe, while the free person dug out extra dirt by hand, moved around the trash can that we were using to stand the auger against, etc. Dad was a great help and the three of us were able to get it all done quickly and easily. Thanks Pop! We rented the auger for 24 hours, and since we only go it around 1 on Saturday, we had all Sunday morning to do a little clean up. Sunday we took twine and strung it along all the rows in the back yard. This allowed us to see in the rows were straight and if any of the posts were out of alignment. It was good we did this because there were several posts that needed adjusting. Joe and I tried to adjust the holes manually with shovels first, but that was not really effective, so in the end we used the auger to adjust the holes as needed. We had residual soreness from Saturday, so the work Sunday seemed a lot harder, but we got ‘er done. Over the weekend I went sailing for the first time. It was me, Joe and Joe’s mother. I had never been sailing before, so I was really looking forward to this. Turns out, I HATE sailing. Sailing involves a number of the things I loath: being cold, being wet, and having wind blow on you. I tried to keep my whining to a minimum, so that Joe’s mother did not think I was a bitchy, whiny cow; but it was really hard. I was freezing the entire time. I was worried about being cold so I brought along a whole lot of layers, but they did not help. The wind just blew right through them all. The boat we went on is considered a U.S. National Park (don’t ask me how a boat can be a park), and it has no inside section where you can get away from the wind and NO bathroom. What kind of dumb boat tour expects people to be cool with being on a boat for 4 hours with no way to get out the wind and no way to pee/vomit in private. I just looked it up. The boat we went on was the Alma, and tours cost $40. It might be fun if you are into sailing, but a better (and cheaper) trip is just to get on the ferry that goes around the bay. There are several ferries but the one I really like I believe is called the Golden Gate Ferry. You get to see the same views, you have the option to get off and walk around cute little bay towns, AND there is a nice bar with great bloody marys. Yum. Sailing was Saturday. On Sunday Joe and I did more work on the vineyard. 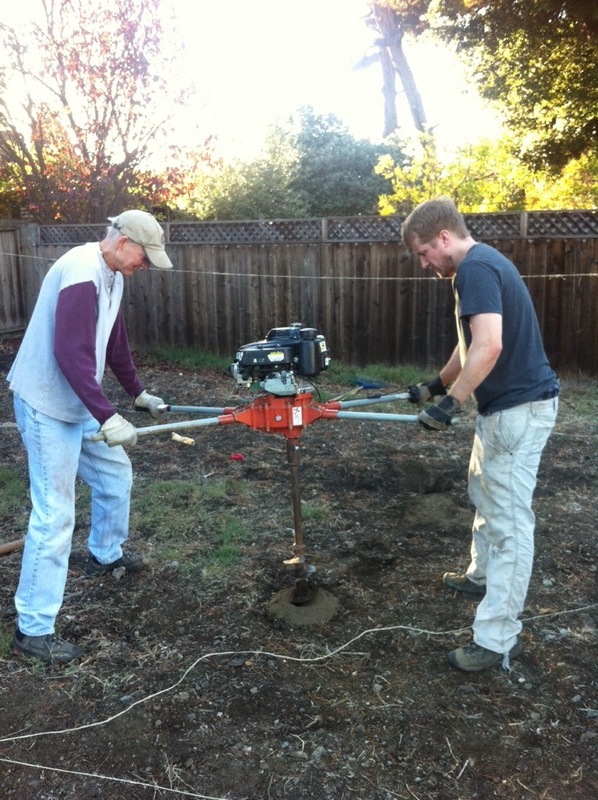 We rented an auger and started drilling the holes for the posts. We bought 8 foot wooden posts. 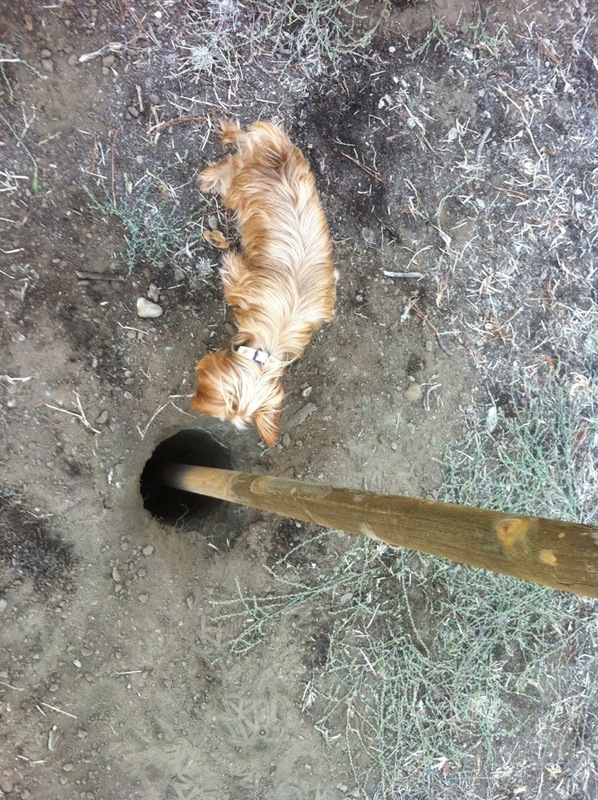 We needed to dig 2 foot holes, so that 6 feet would be above ground and 2 feet below. We rented a single person auger, hoping that would make digging the holes easy. We had seen YouTube videos where people easily dug 2 foot holes using the single person auger. I don’t know if we were doing something wrong, my ground is too hard, or if our auger just sucked, but it did not work well. The auger would dig through the first several inches of loose top soil easily, but then it would spin around worthlessly. It seemed like the ramp section was set too high, and it would not catch the soil, so the drill portion would just spin around on it’s tip on top of the soil and not actually lift any soil up/dig down. We reviewed some of the YouTube videos, and on the videos the little ramp portion appeared longer and lower, so I really believe our auger just sucked. Joe and I were determined to get something accomplished, so we struggled with our crap auger and, after a full day of working, got the outside post holes dug. It was so satisfying when we finished the last hole and got to see all the posts standing in place. Near the end I was stupid and too tired to control the power tools and ended up hurting myself. I lost control of the auger and ended up whacking my left shin & knee several times. It is currently swollen and I expect to have an epic bruise in a few days. We still have the inside posts to do. We hope to get those done next weekend, and we plan to rent the two person auger. I have no idea if the two person one will work better, but it can not be any worse. Over the weekend we re-did the marking out for the vineyard posts. We originally used landscape flags to mark out where we wanted the posts to go, but my naughty puppy figured out that it was fun to rip the flags out of the ground. 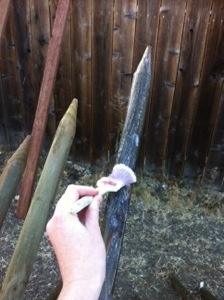 This time we redid the markings with wooded stakes. These are heavier and get planted further into the ground, so hopefully she will not be able to rip them all out. For figuring out how to mark out the posts, we determined that it was easiest to determine where the corner posts go, and then work backwards to figure out the placing of everything else. We are doing a 6 by 6 arrangement, 6 feet between rows and 6 feet between vines. Our lot is not quite perfectly North-South aligned, so our rows are running at about a 105 degree angle rather than perfectly 90. I actually prefer this, as I think it is more aesthetically pleasing. Next weekend we are going to rent an auger to dig the post holes. Hopefully that goes smoothly and we can get all the posts in the ground. After that comes the landscape fabric mulching. I am not looking forward to that part. I did the mulching once several years ago. It was extremely hard work and because I did not use landscape fabric, it did almost nothing against my weeds. This time I should have more help, which will make the job go faster, but I am still bitter about the last time being so un-successful. I am also getting the most heavy duty landscape fabric I can find so that the weeds hopefully never return. My awesome cousin James is getting married in February in Kona, Hawaii. He is marring a lovely lady named Katie and my whole family is flying out to the Big Island for the wedding. Yay for James for landing an awesome girl and Yay for me for getting in more travel! I spent the last several days trying to determine the most cost effective way for my family and I to travel to Hawaii. I was trying to book for myself, my mom & dad, and Katy & Evan. Originally we considered renting a house, but after a lot of research I determined that renting a house did not save us all that much. We would want a place with a number of bedrooms, and my mom wanted something nice. All the really nice rentals were not actually that much cheaper than hotels and do not come with maid service, pools, etc. Plus a lot of the rentals are on golf courses, not at the beach, and we want beach access. Next I considered arranging the trip ourselves (flights, rental cars, hotel, etc.) or going with a tour package. The tour packages are a significantly better deal, but you have to be careful who you book with. I originally tried to book through United.com because I get miles, except the competitive price package United offered insisted that I share a room with my parents. Whereas with Expedia.com, I was able to get a better hotel for a little cheaper, and I got my own room. The only difference is we are flying Alaska Airlines rather than United. I tried to point out that I was getting two bedrooms at a better hotel for cheaper to the travel agent at United, but they still refused to try and adjust their package to give us more than one bedroom. My parents and I are only going to Kona, and we will be staying at the Waikoloa Beach Marriott. Katy & Evan are going to go to Kauai first, and they are staying at The St. Regis Princeville Resort. They will be there for a few days and then come and join everyone in Kona. Katy and Evan got their scuba licenses this summer while they were in Brazil. I am hoping to take a few scuba lessons in Hawaii and get my license. That way I can scuba with them. It should be an excellent trip and I can not wait to go. 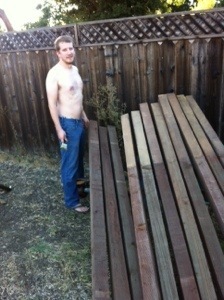 This weekend I bought the wood for the trellising and Joe and I started to prep it. 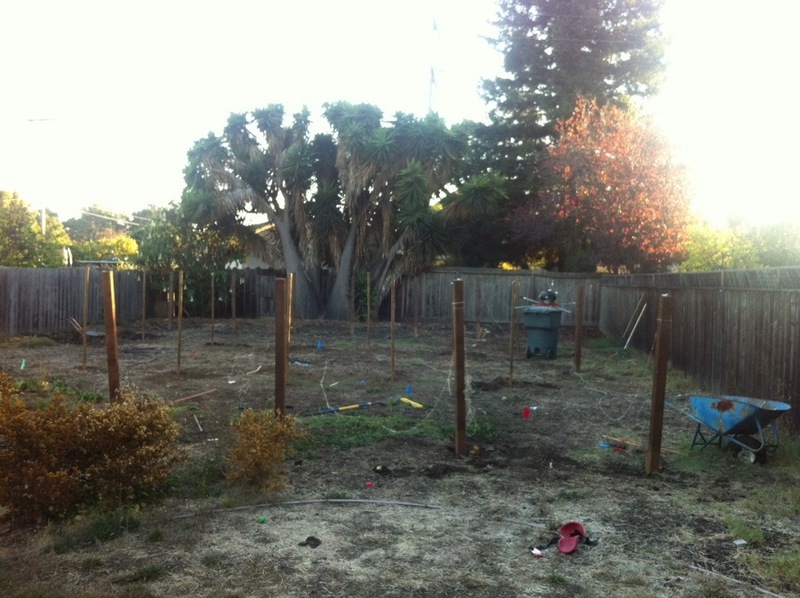 We purchased 12 4x4s, 11 ’8 round posts and 3 2x4s. All the wood is pressure treated but we still need to treat any part that will be in the ground with sealant. 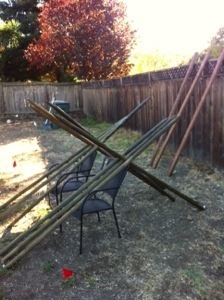 Pressure treated wood with sealant should make for trellising that will last about 20 years. We are in this for the long haul. We got the wood from Home Depot. We purchased from Home Depot because the prices were in line with the other stores we price checked, but Home Depot has the added benefit of having trucks you can rent for 75 minutes for only $20. Since the boards are all 8 feet long and would not fit in our cars, the ability to rent the truck was a big plus. After we got the wood home and the truck returned, we went to the local pub for some lunch and football watching. The Cowboys were in true form yesterday and managed to blow an 11 point lead. After the game we returned home and painted on the first coat of sealant. We are using Bear Paint deck sealant. There are many different kinds of deck sealant, and I did not know which to choose, so I went with the one that said it lasts the longest. 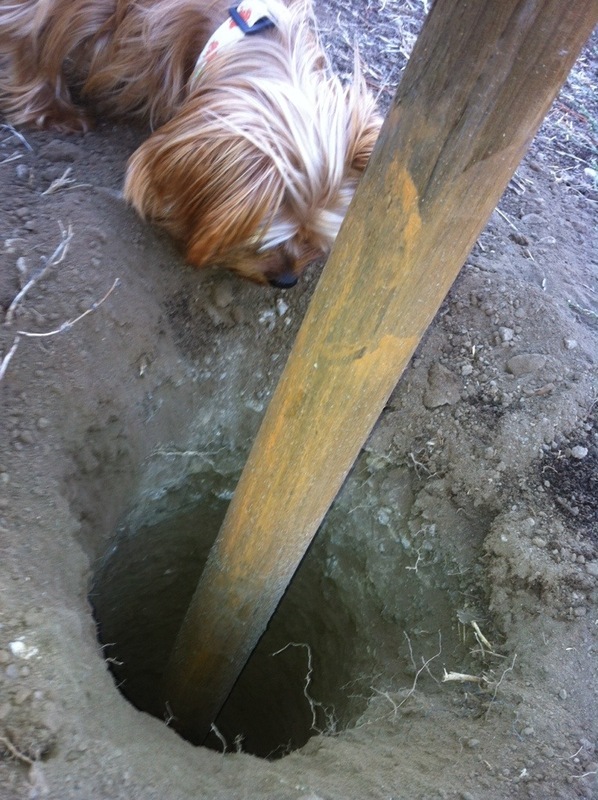 We have to seal all parts of the posts that will be in the ground. This should help keep the wood dry and delay rotting. The first coat of sealant is now on the wood. Will will likely do one or two more coats before we put the stakes in the ground. Before we can plant the stakes, we need to till one more time and auger holes. After the stakes are in place, we can order the landscape fabric and mulch. Here are some pictures of us prepping the wood. 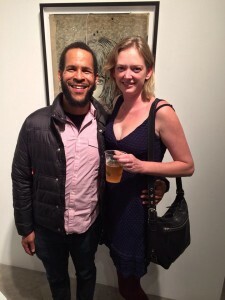 Last night I went to a Secret Salon event at White Walls. It was free (yay!) and included beer & cocktails and food. There were also artists doing their thing and making art, a poet and a singer. 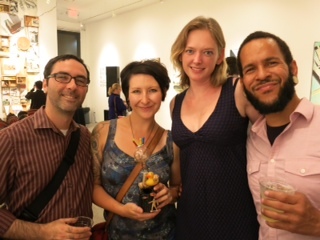 I went with Noah and his friend Zilch and Zilch’s wife Cathy. We had a pretty great time. I got to make a super hero robot dude, watch a pretty good artist make interesting drawings and make some new friends. 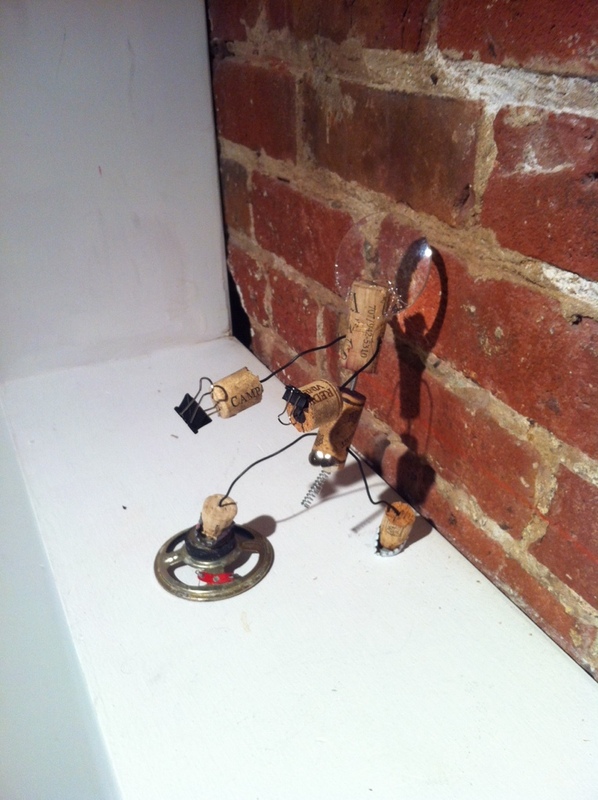 Robot Dude – Notice his junk? I left him in the ladies room at the gallery and when I went back later he was gone. Hope he went home with a sexxxy lady. Tonight I am going back to SF for WhiskyFest #7. I am going with Cathleen. We did this last year and it was a blast. Hundreds of different whiskys, hot dudes in suits, tasty food; it is good times. We are spending the night at the Hotel Palomar. The event is actually at the Marriott, but the rooms there were almost $600 a night. Every other hotel was $200-$350. I have no idea why the Marriott is so much more this weekend. I have stayed at the Marriott before and it is not a great hotel. The Palomar is $330 and across the street from the Marriott, so it should work out well. I have never stayed in the Palomar before, but I will update with my impression & a detailing of WhiskyFest fun times tomorrow. The vines are ordered! The total cost is only $306. 25 Syrah and 25 Cab. I paid a deposit of half of that and pay the rest 72 hours after the vines have been delivered. I am very pleased with the price. I saw vines for about $10 a vine at a lot of places, so $6 is almost half that. Woot! It is busy season and I am going to be busy this weekend, so I doubt I will get a lot done on the yard. I did find out about a local nursery that is going out of business this weekend, and they are having a 40% off everything sale. I am hoping to get over to that sale this weekend to see if they have landscape fabric or anything else I can use. 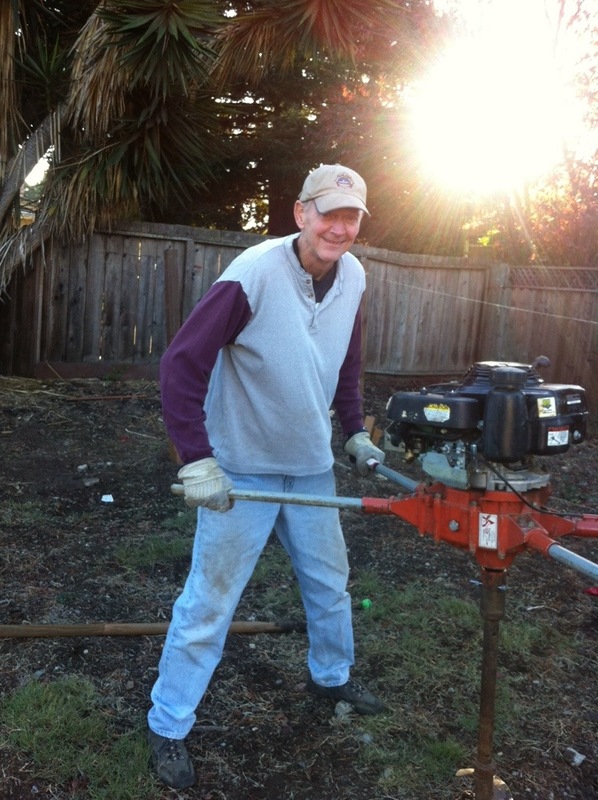 The next big steps are re-tilling the land and buying the wood for trellising from Home Depot. I am so excited for my future #homevineyard.